When we describe the government, there is a common perception: we, as citizens, often associate the word “government” with negative terms, such as “too complex”, “too much control”, “scary” and “locked public administration”. This, of course, doesn’t come out from nowhere. Even in high-income countries like UK, we see how public trust has been eroded for years. People working for the government, on the other hand, have their own views. They may consider themselves as “open” or “transparent”. Some claim to be “citizens’ best friends”. From my own experience of working with public officials in Indonesia, some complained that their (good) work wasn’t appreciated by their constituents. The disconnection between citizens and the government is problematic. This, perhaps why, among other reasons and despite best efforts, many civic engagement initiatives struggle to bring long term social changes. How can we ensure that citizens, government and civic society work together? Or is this idea even possible? The language that we use to communicate our key messages to the government matters. Prof. Jonathan Fox of American University points out that “accountability keywords have different meaning, to different actors, in different context - and in different language”. The resulting ambiguities can either constraint or enable our engagement strategies. The expression “hacking the system”, for instance, can be threatening for government officials, although it’s widely acceptable among activists and software developers. There is a need for shifting the mindset and acknowledging the power dynamic between citizens, the government and civic society. Citizens and civic society should be considered as a single entity, not separate ones. Civic society has the role in supporting the government for delivering their mandates. The government has to acknowledge, respect and embrace this as an opportunity, rather than seeing it as risk. The Buenos Aires city government, for instance, has done very well in engaging its citizens, but less so - with civic society. What could they do differently? And, vice versa, what could civic society contribute in this context? More attention should be given to finding out how the government can bring its institution closer to citizens and civic society, and how all stakeholders can support each other. A number of civic tech tools and platforms are now available to facilitate this process. The challenge is that many of them fail to deliver the intended results. The mismatch between citizens’ information needs and the data published by the government in open data portals is an example of that. One may argue that citizens should be involved in the process of designing and implementing civic tech platforms to increase the chance of their success. What often is overlooked are the tangible benefits of civic tech which can help the government officials in doing their day-to-day tasks. Should civic society build the technical capacity of the government, e.g. digital and data literacy skills, in order for them to utilise the benefits of civic tech? Citizens are also concerned, because their engagement activities don’t always translate into the government’s decision making. Mutual trust is the key issue among stakeholders, it is critical for the long term civic engagement. Citizens may distrust government’s intention to be “open”. To quote Ana Neves of Knowman, Portugal, “when the government open its door, one may wonder how open is that door?” The civic society’s role is to facilitate a constructive engagement between citizens and the government. Perhaps we don’t have all the answers yet. 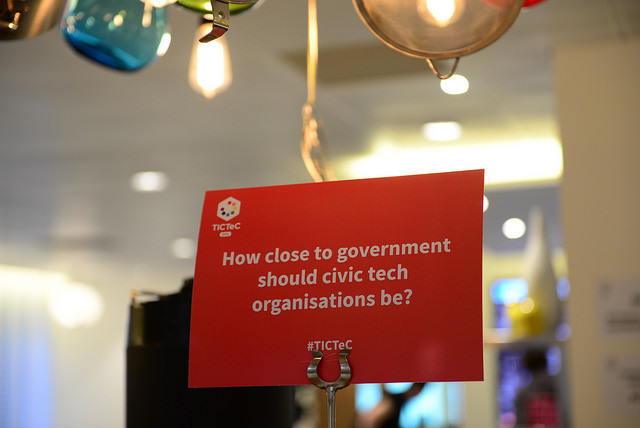 But we have learnt that civic tech is not the end in itself, but a means for a political action. The discussion that we had at TICTeC is a good starting point. More conversations and collaboration are expected to take place outside this conference.